Con But is it a MINI? I’m racking my brains trying to think of the last time a MINI was promoted without such hackneyed expressions as ‘fun’, ‘exuberant’ and ‘go-kart’, and am drawing a blank. With its second generation Countryman, MINI’s occasionally cloying sense of joie de vivre has taken a backseat in favour of practicality, versatility and premium quality. The new Countryman could perhaps be the most grown up MINI we’ve ever seen, and honestly, that’s got me worried. Does this still make it a MINI? Let’s start with the obvious. It’s big. Really quite big, standing 20cm longer, just over 3cm wider and houses a wheelbase 7.5cm longer than its already 4m long predecessor. Stands to reason though. MINI itself fully admits that the old Countryman slotted too neatly between segments, meaning no direct rivals to speak of and an awkward market to simultaneously make its own. The added girth now brings the new Countryman square into line with the Mercedes GLA, Audi Q2 and even big sister BMW’s X1. The extended dimensions mean the ‘biggest and most versatile model’ in MINI’s 57-year history now offers 200mm more rear legroom than previous and 450-litres of boot space (1390-litres with the rear bench folded). Now that the Paceman has been retired and with Middle East customers unlikely to look too hard at the Clubman, it’s a strong selling point for MINI. But again, does more space a MINI make? Is the new look a winner? The team is off to a good start. MINI traditional elements like the hexagonal front grille and button headlights remain, albeit tweaked, meaning the circular lamps are now more oblong and the front grille significantly sleeker. New roof rails have been added to hammer home that ‘bigger is better’ mantra from the customer-dubbed ‘Maxi’ and there’s more pronounced bodylines running down each flank and across the muscular bonnet. It’s a snazzy look, embellished by a tailgate that’s now power-assisted (albeit smaller than the example it replaces) and a Range Rover-style ‘picnic bench’ that slides out of the cargo hold. It’s quirky, and for MINI, that’s a must. Ditto the interior, though built exclusively for the Countryman in Austria, has a certain MINI-style goofiness about it, which you’ll either like or you won’t (I do). The speedometer has long since been retired from the dashboard dominating centre screen, but in this now lies, for the first time, an updates touchscreen, meaning owners of a loftier persuasion don’t need to fidget for the awkwardly placed rotary dial behind the gear-lever. The switchgear, while placed a little too fussily together, is still very charmingly bespoke and premium (that buzzword, again) and the driving position, though considerably higher than MINIs of old, is still comfortable. They weren’t kidding about increased cabin space either, with head and shoulder room in the front considerably more generous in the front, similarly legroom in the rear. What’s the handling and drivetrain like? It’s a solid start for the Maxi then, but things do start to unravel when it comes to the drive. There are elements of the MINI charisma certainly, especially through the handling, the steering offering a wonderfully meaty and accurate texture that, despite the 1535kg kerb weight, doesn’t feel overly woolly or power-assisted. But the steering ratio is a bit quicker than you’d expect for a vehicle of this size, something you’ll need a while to dial into before really leaning on the front end, where, once again, there are a couple of quibbles. Feed the Countryman into the longer sweeps and the revised suspension geometry and substantial grip from the tyres means bodyroll is surprisingly absent. Fling the front end in with a flick of the wrist and the front end threatens to wash wide with all that girth behind it, though fortunately the all-wheel drive system kicks in just subtly enough to nudge the front wheels back into line. Deep trouble is avoided thanks to remarkable amounts of grab from the brakes. Impressive in some ways, but not exactly MINI in others for the handling then, and it’s a similar issue with the drivetrain. With the new Countryman comes two ‘newly developed’ petrol engines, a 134bhp three-cylinder in the base model and a more sprightly 189bhp TwinPower Turbo four-cylinder in the Countryman S. First credit goes to the 280Nm (207lb ft) of torque in the latter, available from an impressively low 1350rpm and thus offers plenty of low down pick-up, maintaining said grunt up to its 4600rpm peak. The189bhp just doesn’t ignite the fireworks in the way we’ve come to expect from MINI, but pick-up is sharp and acceleration punchy in the mid-range, and there’s still a degree of top end punch since the bhp doesn’t hit its high notes until 5000rpm. But with both 1535kg to haul and the AWD system feeding the power more ‘sensibly’ to all four wheels, the four-cylinder feels less spiky and vibrant than its smaller sibling. 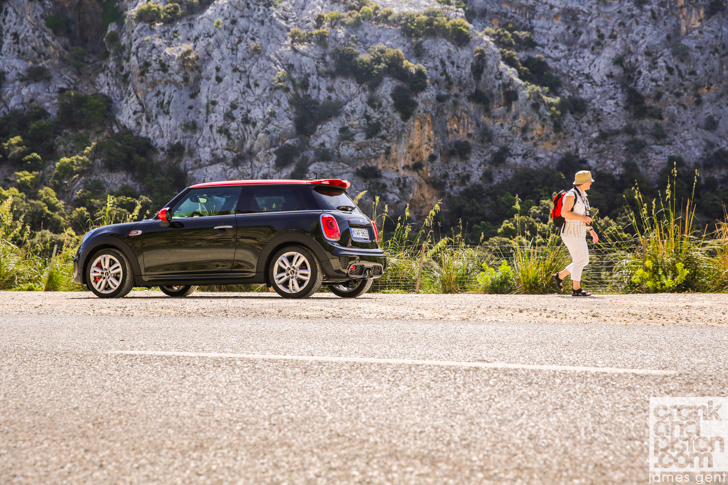 The Countryman still feels nimble with an impressive degree of agility, and the engine punchy in the lower revs, but the package just doesn’t feel as darty as a MINI – even the biggest one yet – should. Ironically, in prioritising sportiness when tweaking the suspension, the ride comfort lacks suppleness as a result, though, admittedly, it is a considerable improvement over the outgoing model. Positives do emerge from our drive in the new Countryman though. With a focused market segment, MINI’s newboy will likely find a loyal fan base with established MINI owners looking for something more ‘sensible’, and given that MINI’s biggest model in its 57-year history offers a strong new look, a surprising amount of agility, and impressive cabin space means less than feisty acceleration and a touch of lethargy through the corners shouldn’t affect the new Countryman’s success. Is it ultimately a MINI though? Time will tell. Enjoy our MINI Countryman S test drive?